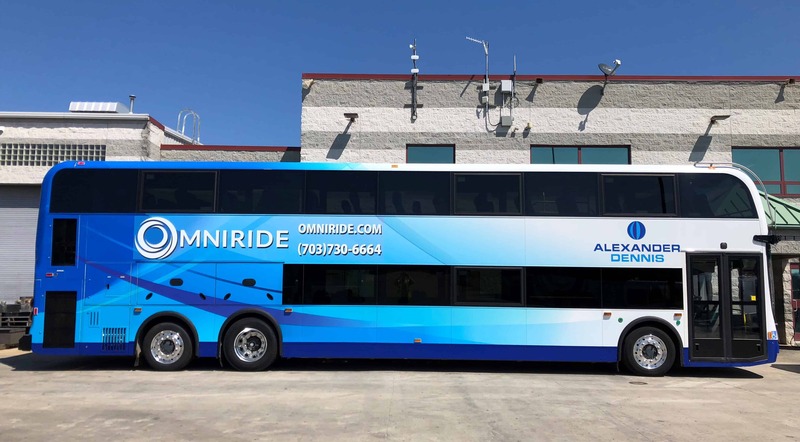 OmniRide will test a double deck commuter bus for the next few weeks, and passengers who climb aboard will be asked to fill out a survey instead of paying a fare. This is no sight-seeing bus, but riders taking in the views from the panoramic second deck windows might disagree. The bus has a staircase toward the front interior and a video monitor at the staircase so passengers can get an indication of how full the second deck is before climbing the stairs. OmniRide staff currently are examining all Express routes to ensure the bus can operate safely within the existing infrastructure, i.e. passing under bridges, making tight turns, and other maneuvers required when serving top destinations including the Pentagon, Metro Stations and downtown Washington, D.C. While routes are selected for testing, a handful of operators will be trained to drive the 42-foot vehicle, which is 12-feet, 10-inches tall. Then, starting the week of April 8, the double deck bus will be placed into service for about eight days, said OmniRide Executive Director Bob Schneider.